Freckles and Flowers: The Moon! 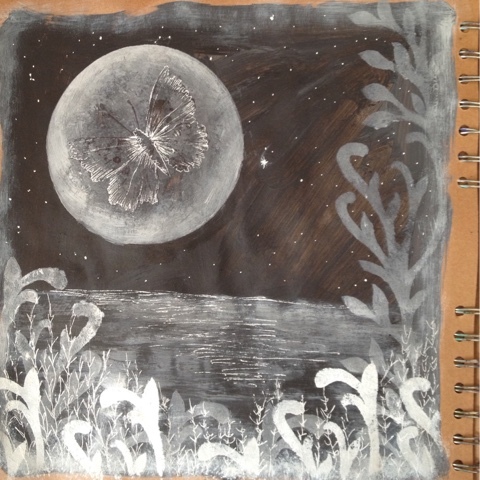 I've been promising for ages to do a step by step tutorial on making and using circle stencils in an Art Journal. If you'd like to follow along with this post you will see how simple it is to get some lovely effects with just a few circles cut from plastic and some black and white acrylic paint. 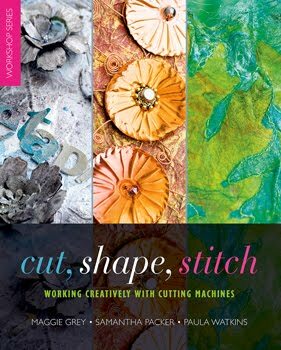 I started by cutting my stencil from Mylar and a Sizzix Circle Die but you could cut one from plastic by drawing around a cup, a small bowl or anything else in a variety of sizes. The thing that I like about this Sizzix die is that it cuts 3 perfect circles and that it is endlessly repeatable. You also get the perfect matching Masks. All very quick if everyone at a workshop wants to cut a set for themselves! Let me know in the comments if you'f like a post about using masks. In my journal, I started by painting my page black. As usual, I had a bit of white on the brush too so that I got a variety of shades of grey along with the black. This will give you a much more interesting background. Now place the largest circle stencil in the top left side of the page and swirl paint around within the shape. It is good to keep the paint pretty dry on the brush to avoid the paint seeping through the edges. As you can see with mine, I didn't follow my advice! But all will be fine in the end. I never worry about these things. It is better to have some great texture than perfect edges. You can paint in the edges later if you go wrong. I stippled some black paint onto the moon with a dry brush and them used a scrunched up piece of tissue to take some paint off and add texture at the same time. Next I added the water. For this I used the paint that was left on the brush to drag horizontal lines across the page. And then dragged black across to add shadows, bring out the highlights and create the effect of the the moonlight on the water. I then added a border with a stencil I made and a Stampendous butterfly stamp onto the moon. On the journal page at the top of this post you can see that I have highlighted the details on the butterfly with a white gel pen and then used the same pen to add foliage to the foreground of the scene. I have also added stars to the sky with a tiny brush. You can also do this with the gel pen. I will add the finishing details when this page is dry and add it to this page tomorrow. Happy Moonlighting! Update! I've added the white pen details to he butterfly, water and added foliage to the foreground. Finished! Shiny and New: Coming up soon.